I joined Sylvia at Sentinel High School again as her two classes learned about experimental design. They had been given an article the previous session detailing an experiment about the efficacy of floating islands in removing excess nutrients from the water. Broken into groups, the students sifted through the fancy terminology and scientific structure of the article to find the key points to summarize. Sylvia had the students write unfamiliar vocabulary words on the board. She addressed the first word off the bat as it pertained to the experiment's first design. "Batch mesocosm can be one of those stressful words," Sylvia said. Mesocosm just means medium-sized-world, as the experiment was not on a tiny scale or a large scale. "Batch" referred to the way the researchers included water in the system. They created batches of water that mimicked the composition of natural pond or creek water and held it motionless in containers. This is contrast to the second design, which allowed that water to flow. The students described the batch mesocosms as being a box shape with a native macrophyte on the small floating island. Sylvia then explained another vocabulary word. "A microphyte is basically a small plant." Like algae. She compared the prefix to the word "microscope" which the students were familiar with, to make the connection that microscopes help you see tiny things such as microphytes. A macrophyte, then, is an aquatic plant that is large enough to see, like grass. So each little island had a native plant living atop it. "Why do you need a control?" Sylvia asked. Sylvia explained that one of the batches did not have a floating island or any plants, just a metal sheet to produce the same amount of shade. This plantless batch was the control. "So, to compare to the other one," a student said. "Why do they have three experimental tanks?" These would be the batches with plants. "Alter them to see different effects," a student suggested. Indeed, a researcher would use their experimental tanks in comparison to the control to see which variables produce measurable changes and which do not, or which produce the most change. Sylvia got to a more basic point though, which is that researchers want to make sure their "data is stable." This means that they gather enough data from the experimental batches that they can find a pattern across all of them. This ensures that if, for example, one of the plants is dying, it doesn't determine all of the results. Having extra batches helps make sure the correct variables contribute the desired information. Then they moved on to the next design. The flow tanks took place in "a giant shipping container" divided in half lengthwise with water flowing through each side. Here the researchers wanted to know if the rate of water flow mattered, so one side had slow-moving water and the other had fast-moving water. The steel container had a special coating to prevent metal ions from entering the water, since they can be toxic to plants. Each side also had soil at the bottom. Sylvia reminded the students that soil can have nutrients in it, especially when it contained decomposed materials, so the soil imitated natural conditions where the nutrients came from within the system. "One of them absorbed more than the other," a student noted. "Yes, definitely. Which one?" Sylvia asked. "I think it was the high flow," the student answered. Sylvia reviewed the previous lesson on the phosphorus and nitrogen cycles. Both of these are nutrients that are important to plant growth, but in large amounts they can lead to the overgrowth of microphytes: algae blooms. The side with high water flow had more of these nutrients removed by the floating island plants, indicating that faster streams are better at preventing algal overgrowth. With the design out of the way, Sylvia broke the experiment down into its most basic parts. She guided the students through identifying the dependent and independent variables of each design. The students identified the dependent variables fairly quickly (the presence or absence of a floating island in the batches, and water flow in the flow tanks), but had trouble with the independent variable. Sylvia emphasized that the answer was simple, and the same across both designs, since the researchers were interested in one thing. This was the level of nutrients (phosphorus and nitrogen) in the water, as lower levels mean the floating islands are removing them more effectively. These experiments both took place in a laboratory environment, which is useful because "you can control what happens," as one student said. In other words, there are fewer variables at play because you can choose which ones to include, which then "makes [the data] easier to interpret," as Sylvia said. Field experiments have advantages too. "You get all the natural things that could happen right there," another student said, so you don't have to try to replicate all the variables that do exist and interact. If an experiment left some of these variables out, the results might not accurately reflect what would happen in a real ecosystem when one variable changes. This helped the students realize that an effective laboratory experiment should aim to be as much like the natural system as possible. Sylvia set the students to work in small groups on a worksheet that asked them to identify other variables that could be important in designing a floating island experiment. I wandered around to guide their thought processes, without giving away any answers. Sylvia's repeated use of small groups was intentional, as it can help students develop leadership and social skills through conversation practice. It also helps them consider multiple angles and the ideas of their classmates when dealing with complex issues. Many of the students looked sleepy and stayed quiet through most of the lesson, as I remembered I was during my high school mornings, but the answers on their worksheets gave away the connections they were making with the material. Sylvia was thrilled. Water composition is pretty important for ensuring a watershed is healthy. That's why Stream Team checks pH levels and turbidity, for example. 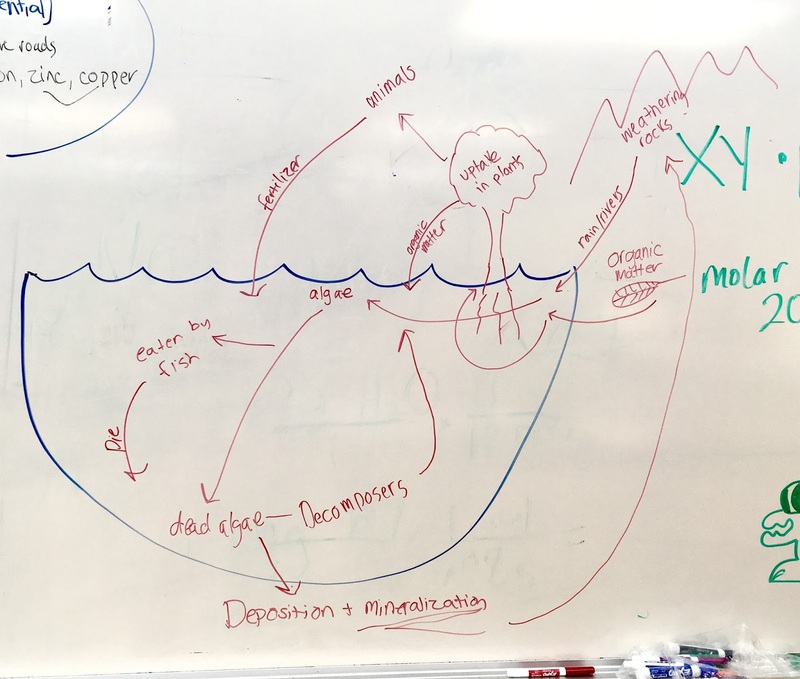 It's also why Sylvia brought up conductivity, turbidity, and metal content in her wetland health class at Sentinel High School. "What is conductivity?" a student asked. "Conductivity - how charged the water is, like how many salt ions are in it," Sylvia explained. "What does salt do?" came another question. "[It] dehydrates animals," like fish, Sylvia said. 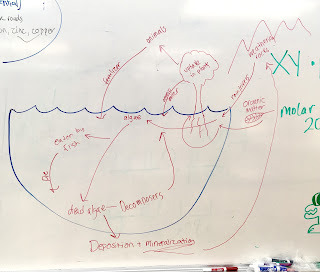 The students thought of ways metal could get into lakes and streams in Montana. Magnesium chloride could come from road salt that washes into drains. But salts aren't the only metal ions that can enter water. Sylvia hinted that many may come as a result of mining exposing materials to surface water. The students thought some more and suggested arsenic, lead, and mercury. All good answers, but most common in Montana, Sylvia said, are zinc and copper. These minerals aren't that bad for humans, but they are unhealthy for plants. One way plants are helpful for wetland ecosystems is by holding soil with their roots. If plants start to die from mineral poisoning, their roots no longer protect the dirt from erosion. Water then can pick up bits of that soil, increasing turbidity. Turbidity is the level of suspended particles in the water. If you've ever waded along a beach or shorefront and seen little clouds of dust kick up under your feet, you've seen turbidity in action. That tends to settle back down, though, when the water doesn't move very much, like in a lake. In a river, the current constantly picks up soil particles and carries them downstream, eroding the riverbed and banks. All these dirt particles in the water make it hard for organisms like fish to see and breathe. The plants dying has an additional consequence: their decomposition adds to the layer of silt on the bottom, releasing phosphates and nitrates into the water. "Phosphates and nitrates cause algal blooms," Sylvia said, and "silt and the algal blooms cause higher turbidity." "Where does phosphorus come from?" Sylvia asked, starting a diagram on the board. After a quick look at posters the students had previously made, they said, "decomposing organic matter." "Phosphorus is really unique in that it is never ever in the atmosphere," Sylvia said. This means that phosphorus can only enter the water system when it is released by dead organisms and soil. When contaminated plants die off, they release this nutrient, which algae loves. Algae doesn't need to root itself in the soil, but rather "blooms" on the surface where the sun's light reaches. With fewer roots and more algae, the soil can be stirred up even more easily, causing even higher turbidity. Combined with the reduction of oxygen in the water, the increased turbidity makes it harder for any other organisms to continue to survive. 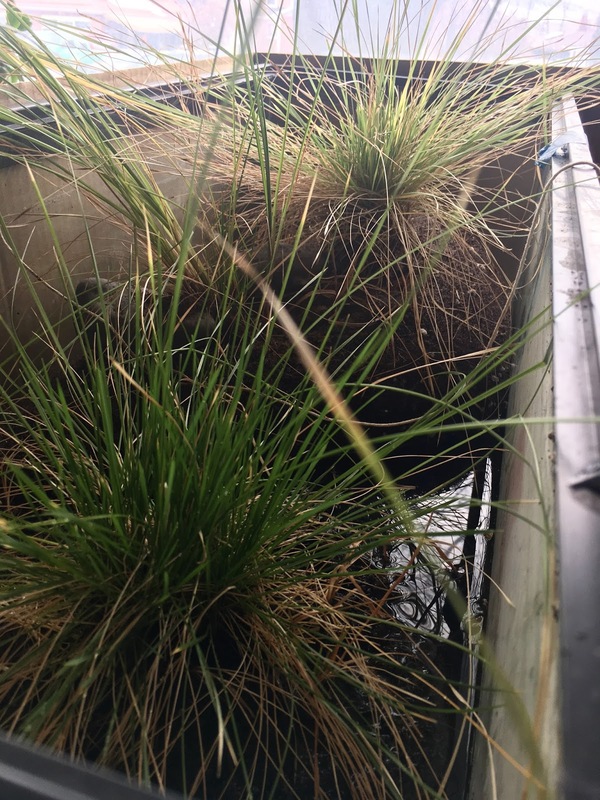 Adding floating islands to wetland ecosystems allows additional plants to grow on the water's surface to pull phosphates and nitrates out of the water, preventing algal blooms and maintaining or restoring balance. Guiding the students through the natural pollutants of wetlands, Sylvia improves their understanding of how natural processes work when in or out of balance. 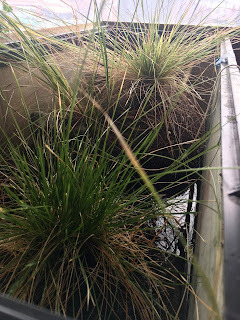 Knowing how these process work provides a foundation for understanding why and how floating islands can restore wetland placed in the Pattee Creek retaining pond down the street. The wetland processes won't be abstract ideas that happen elsewhere, but physical processes that occur in their very own neighborhood. The strategy of using floating islands for restoration also teaches them that taking care of their environment is feasibly in their own hands, and that environmental damage is not a lost cause.